A Message from Harrow Film Office. 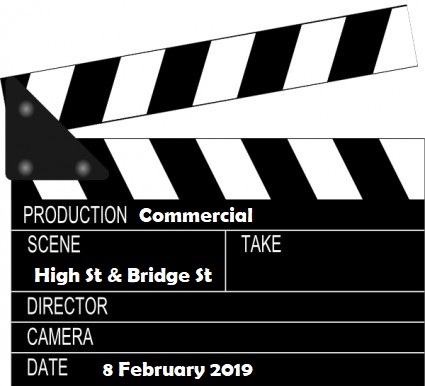 On February 8 filming will take place on the High Street, Pinner between 8 am and 1 pm. A film crew will be filming an actor walking down the High Street towards Bridge Street with extras in the background gesturing towards him in the promotion of a well-known restaurant brand. In the interests of safety and to facilitate the filming, the Council have approved the use of Traffic Diversions during the filming period to prevent cars from travelling along the High Street. Diversionary route signage will be in place to divert traffic around the High Street for the holding duration time periods. Stop / Go points will be positioned at the following locations; at the junction of Bridge Street and the High Street and further up on the High Street just before Grange Gardens. The film crew have been authorised to hold traffic for a maximum of 2 minutes only between 8 am – 1 pm to allow the filming sequences to take place. Compliance with the 2 minute holds will be closely monitored by a member of Harrow Council’s Highways department. Under Traffic Order, all bays along the High Street have been suspended between the hours of 00:01 and 13:00 on the 8 February. As an alternative the public are advised to use the pay and display car park at Chapel Lane. To reduce the inconvenience the film company have agreed to support any disabled car user wishing to use the disabled bays along the High Street and filming marshals will be available in the morning to support this. Any planned deliveries to businesses along the High Street are being coordinated by the Location Manager in order to avoid disruption to business. In the afternoon the film crew will be filming within the confines of a barber shop along Bridge Street and four bays will be suspended in the afternoon directly outside the property. There will be no disruption to traffic during this sequence. Finally, the Council have agreed use of Waxwell Lane car park as a filming vehicle compound all day on Friday 8 February and so the majority of the car park will not be available for public use. However, a row of 12 bays will be available for permit holders and disabled car users. We do apologise in advance for any inconvenience this may cause you.